You may have noticed that we love quotes of all kinds, so today we’re featuring art quotes, from our creator’s community, ourselves and from the best scoured online. Quotes can be like mantras, invocations, affirmations and a pep talk from the universe. Like any tool, quotes help, if we put them to use. You’re invited so send us your favorites and we’ll publish them in future quote articles. It can be your own quotes and/or those from others. Include your name and site or social link if you’d like us to include that in the contributors section. We kick of this list of 90 art quotes with one of our favorite from the multi-talented photographer entrepreneur, Chase Jarvis. We think Chase sums it all up for artists in any medium seeking to make a living from your art. My experience says that if you put out a lot of personal work that’s good, it tends to attract high dollar commercial work. But to be clear – I don’t create art to get high dollar projects, I do high dollar projects so I can create more art. ~ Chase Jarvis, photographer, entrepreneur, creator of CreativeLive, as featured on Forbes. To seek beauty is our nature. To create beauty is to align with the universe, and be transported. An artist has only 2 choices: make excuses or make art. To create is to align with the creator. The best camera, is the one that you have with you! I think the role of the artist is, is to take whatever it is they believe in and put it out there so the public can see it. Creativity is the new literacy. There are only two options: make progress or make excuses. My need, my job, my purpose, my goal, my hope… isn’t to do good art. It’s to do my art. I don’t want life to imitate art. I want life to be art. Overcoming fear and conceiving this ‘art of more’ should be a fundamental practice in what it is that you do and make. I try to take every disadvantage as an advantage. My aim is to show the visible as possibility in a state of perpetual becoming. For me, imperfections turn out to be a path to freedom. Once I’ve “ruined” a project, I don’t have to worry about doing it perfectly any more. I can just get on with it. I have no fear of making changes, destroying the image. Because the painting has a life of its own. I paint my flowers so they will not die. To create is to bring forth love… to conceive it, to birth it, nurture it, raise it up and release it to a life of its own. Art is a subset of creativity. It is not a torment to be an artist. It is a privilege. To be great, art has to point somewhere. Being an artist… a lot of what it really means is trial and error. Trying things that don’t work… that’s how you learn. My goal as an artist is to create art that makes people look at the world in a different way. Art is an instrument for peace and creativity. To touch art is to touch the mind; to touch the mind is to touch a life. Art, when inspired with love, leads to higher realms. Love art, and that art will open for you the inner life. It is the artist’s privilege to turn any effort into art. Portfolios are everything, promises are nothing. Do the work. Art is man’s nature; nature is God’s art. Art touches the soul… art is communication… it reaches out from the canvas and passes through the eyes of the viewer right into his heart where it can leave an imprint of beauty that can make the spirit sing. Art is like therapy; what comes up is what comes up. It may be dark, but that’s what comes up. You may want to keep some of it in a drawer… but never judge it. Art begins with resistance, at the point where resistance is overcome. No human masterpiece has ever been created without great labor. Art is born in attention. Its midwife is detail. A picture is a work of art, not because it is ‘modern,’ nor because it is ‘ancient,’ but because it is a sincere expression of human feeling. The purpose of art is to bring people into presence. What was any art but a mould in which to imprison for a moment the shining, elusive element which is life itself. Art seems to me to be a state of soul more than anything else. 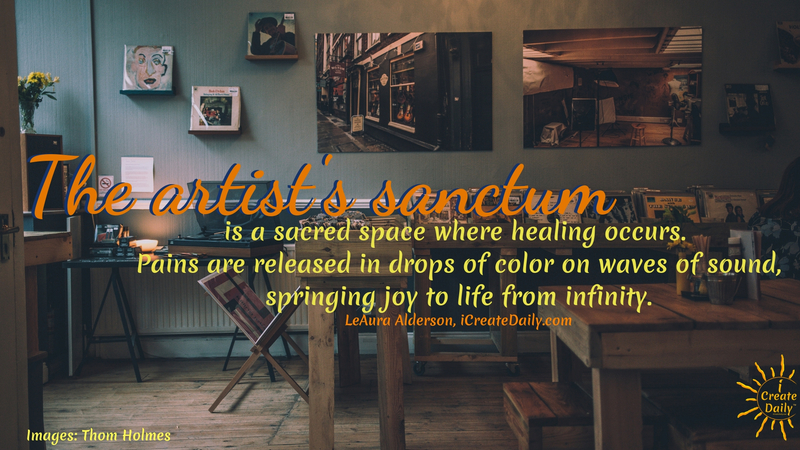 The artist’s sanctum is a sacred space where healing occurs. Pains are released in drops of color on waves of sound, springing joy to life from infinity. Art is our memory of love. The most an artist can do through their work is say, let me show you what I have seen, what I have loved, and perhaps you will see it and love it too. I believe art is foremost for the artist who creates it. You do it for your soul, and if the rest of the world gets something from it, that’s a bonus. Art is a meeting between self and soul. Each time the conversation is different. Art, in all its forms, is the true history of the world. Art is a necessity – an essential part of our enlightenment process. We cannot, as a civilized society, regard ourselves as being enlightened without the arts. Art is the idealization of the real and realization of the ideal. Don’t worry about mistakes. Making things out of mistakes, that’s creativity. All art, whether it pleases us or not, helps to add color, excitement, joy, or sadness and, most often, a sense of awe to our life’s experience. Art does not lie down on the bed that is made for it; it runs away as soon as one says its name; it loves to be incognito. Its best moments are when it forgets what it is called. Art can lead you to God. I think that’s the purpose of everything. If it’s not doing that, what’s it doing? It’s leading you the other way. It’s certainly not leading you nowhere. The artist who creates in sacred silence enters a deep meditative state and is transported to a timeless place that fuels the spirit and kindles the heart to create love into art. A blank canvas…has unlimited possibilities. No artist is ahead of his time. He is his time. Art is just a pigment of your imagination. Art completes what nature cannot bring to finish. The artist gives us knowledge of nature’s unrealized ends. I think… I feel… I create… therefore I am. Art is an affirmation of life. All of the arts, poetry, music, ritual, the visible arts, the theater, must singly and together create the most comprehensive art of all, a humanized society, and its masterpiece, free man. There is no must… no should… no right way. The artist is free to create whatever he or she is compelled to create. Creatives are often empaths, hyper sensitive to pains of others, and of society. Immerse in your art to nurture your heart and visualize love in the making. the bad in the world. Don’t fight in the fray of the masses. Leave the drama and crossfires to others. Your creative soul is not here for that. Creators are guardians of the heart. To create from love is to have more love.